The scene inside the 18,700-seat Fargodome, which serves as the home of the North Dakota State Bison. Three years ago Delaware head coach Danny Rocco convened with North Dakota State head coach Chris Klieman at midfield. North Dakota State had just dispatched Rocco’s Richmond Spiders from the FCS playoffs, with a 33-7 victory in the semifinal round. In the moments between handshakes, Rocco told Klieman that he admired North Dakota State for its long run of success. “Sustaining success is the hardest thing to do in sport, and they’ve done an outstanding job in doing that,” Rocco said, reflecting on the game Monday. Klieman’s team went on to win the national championship that year. They won last year too, a 17-13 victory against James Madison, to push their run to six titles in the past seven years. Only the Dukes have broken up their streak, having defeated North Dakota State in the 2016 semifinal en route to the national title. In many ways, the Bison serve as the example of what the Blue Hens wish to become. 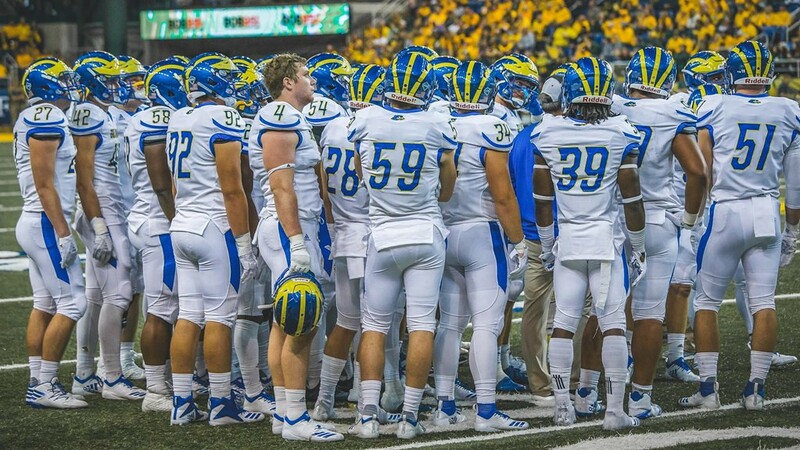 Delaware will get an up-close look this Saturday, when they travel to the Fargo, North Dakota for their final non-conference game of the season. Kickoff is at 2 p.m. est. A capacity crowd of nearly 19,000 is expected to rattle the Fargodome, as the game will serve as North Dakota State’s homecoming. This week Delaware will spend much of their time practicing in the field house, with music and noise blaring, in an effort to simulate the effect of the Bison crowd. The Blue Hens took similar measures to prepare for last season’s game at Virginia Tech and practiced with noise inside the field house on occasion this summer. In addition, Delaware, like most visitors to Fargo, will use a silent snap count. Players must wait to react to the ball moving, rather than relying on audible cues in the quarterback’s cadence. In preparing for the Bison, Rocco will draw on his past experience in Fargo with Richmond and his team’s experience last year playing at the uninviting confines of Virginia Tech’s Lane Stadium. The infamous Bison statue on North Dakota State’s Fargo campus. While North Dakota State is not an ACC opponent, like Delaware has faced in past seasons, they pose a similarly formidable challenge. North Dakota State enters the matchup ranked No. 1 nationally, having defeated Cal Poly 49-3 and North Alabama 38-7. The Bison have come to be defined by a hard-nose brand of run-first football. Behind center is quarterback Easton Stick. Stick won eight games in a row in 2015 as a freshman when he replaced an injured Carson Wentz (you might’ve heard of him), including the victory over Rocco’s Spiders. He has started every game since taking over for Wentz, leading the Bison to a combined record of 35-3. North Dakota State also features two talented running backs, Bruce Anderson and Ty Brooks, who have combined for 363 yards on 40 carries (9.1 yards per attempt) through two games. Like Delaware, North Dakota State will utilize a lot of two tight end sets and two running back sets. As Rocco and the Delaware coaching staff has watched North Dakota State in past seasons from home and more recently studied their film, the years and players blend together. In season after season, and game after game, the players rotate in and out, but the results stay largely the same. “They kind of look like the same team every year,” Rocco said. That’s also despite the coaches changing too. Craig Bohl started the team’s run, serving as North Dakota State head coach from 2003-2014 before leaving for Wyoming. Klieman, who had been the defensive coordinator, took over as head coach. The consistency is the hallmark of a program and culture that Delaware wishes to emulate. Pat Kehoe throws a pass downfield against Cornell. In Delaware’s next matchup at North Dakota State, Kehoe said staying on schedule will be important for the offense. For this weekend’s game, however, the lofty goals of becoming a North Dakota State-like program are on the backburner for Delaware. They’re focused this week on getting off to a better start offensively and “staying on schedule,” meaning the team wants to pick up at least modest gains on first and second downs to avoid third and longs. In the Blue Hens win against Cornell, they were able to complete the deep ball consistently, a major area of improvement from a season ago. But North Dakota State, who returns three of four starters in their secondary and three starters along the defensive line, will make known passing downs difficult. Other areas of emphasis for the Blue Hens are field position, turnovers, penalties and special teams. The matchup will heavily favor North Dakota State, but Delaware likely poses the Bison’s greatest challenge to this point, who have not yet faced a conference opponent. If they’ve had a weakness in the early going, it’s in the passing game, where North Dakota State has completed just 16 passes for 228 yards. “They don’t give up many big plays, that’s the thing,” Klieman said of the Blue Hens. “They’re exceptional tacklers, they do a great job in the secondary of keeping the play in front of you, so you have to earn everything you get. If Delaware wins, it will be one of the program’s biggest wins, if not their biggest since the school’s last trip to the playoffs in 2010. Delaware lost to North Dakota State 38-10 in their first-ever visit to the FargoDome.